Frederick A. P. Barnard was the university’s first “chancellor” (the title was changed from “president” in 1858), and he was perhaps its most ardent and idealistic proponent. He aspired to make the university the greatest scientific institution in the world, establishing an ideal that has challenged and inspired his successors. Born in 1809, he graduated from Yale in 1828 and began teaching. In 1838, he accepted a position teaching Mathematics and Natural Philosophy at the University of Alabama, and, in 1854, he accepted a similar position at The University of Mississippi. Shortly after assuming the presidency in 1856, Barnard convinced the Legislature to appropriate funds to order the largest telescope in the world for the university and to construct an observatory for it on campus. The observatory (now called Barnard Observatory), which today houses the Center for the Study of Southern Culture, was completed, but because of the Civil War the telescope was diverted to Chicago, where it remains today at Northwestern University. 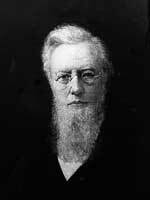 Barnard, a minister and musician, left Oxford during the Civil War and became president of Columbia University, where he remained for 25 years. He is the only University of Mississippi chancellor to be elected as an undergraduate to Phi Beta Kappa.